How to unlock your computer after you’ve forgotten Windows 8.1 password? 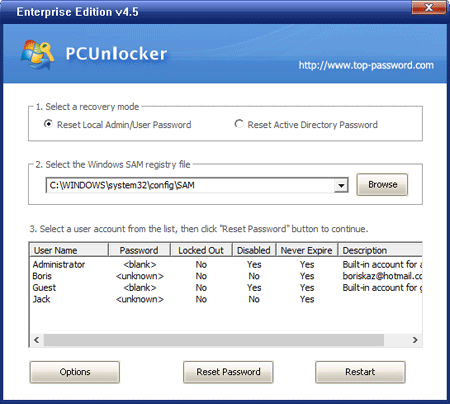 PCUnlocker is a powerful bootdisk that allows you to crack Windows 8.1 password on a computer where you forgot your password. The step-by-step guide below should work for Windows 8, Windows 8.1 and earlier versions of Windows. How to Crack Windows 8.1 Password with A Bootdisk? After you download PCUnlocker, you have to burn it on a CD by right-clicking the ISO file. If you don’t have an optical drive and you want to boot from a USB flash drive, you can use the free tool ISO2Disc. 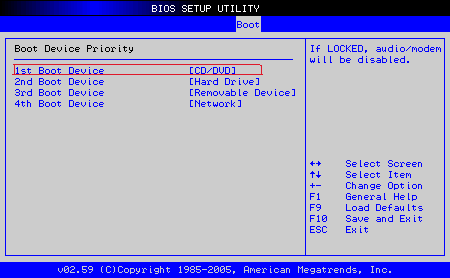 Next, you have to ensure that the CD or USB flash drive comes before the hard drive in the boot order of your BIOS settings. Most PCs allow you to access the PC setup by pressing F2, F12 or Del right after you turn the PC on. If your computer comes with UEFI firmware, you might also need to set your PC to boot with Legacy BIOS mode instead of UEFI mode. After you boot PCUnlocker, you should see the following screen. If you have more than one Windows installation on the computer, be sure to choose the correct SAM registry file for your target Windows installation. Choose the user account where you want to reset the password, click on Reset Password button. This program will remove the existing login password and unlock your account in case it was locked out or disabled. The password cracking process is now completed. Reboot your computer and take out the CD or USB flash drive. You can then login to Windows 8.1 without the need of a password!